For any food business to sustain in this competitive market, what matters the most is; effectively handling the orders, menu items and even a major part of restaurant inventory management. Though that doesn’t mean restaurant promotion and other operations are less important aspects. Each of this has a definite role to play in making your restaurant business a great success. Now, one of the key investments in an F&B business is that of inventory and stock. Basically, a restaurant inventory consists of all the items or raw materials required to prepare dishes, and managing that restaurant inventory would mean, to accurately track the use of each ingredient, in the right quantity in any dish. So as the margin gets tighter (with increasing expenses and decreasing profits), you as a restaurateur have to find ways to reduce the recurring costs. If you’re into traditional ways for food business management, it’s time you switch to digital means. Because manual restaurant inventory management is a cumbersome and a time-consuming task. And, the bitter fact is; little negligence can lead to a major revenue loss. On an average 10-15% of the restaurant inventory goes into the trash. Now the question arises; how to efficiently utilize restaurant inventory and eliminate losses. Right? So in this blog, I’ll be sharing the best practices for your restaurant inventory management. But, before that let’s have an overview of how crucial it is to keep a track of your restaurant inventory. In F&B industry, taking stock of inventory isn’t just simply scanning the barcodes. It applies to the counting of items on the kitchen shelves, and even the ones scattered in storage rooms. Straight off, this makes it difficult for you to manage your restaurant inventory efficiently. However, securing inventory from various risks such as spoilage, thefts, and calamity is a herculean responsibility. The former threat can be effectively handled, but the later’s occurrence is not in your control. First-off, employ an active restaurant POS system at your place. Believe me, it’ll do wonders! It reduces the cost incurred on hiring extra staff for restaurant inventory management, and even aids you in your daily restaurant operations. The system helps you count opening and closing stock during a shift change, tracks the inventory and stock usage, and performs real-time updates of the current inventory on hand. It is obvious that when you’ve brought in automation, training is a part of it. Whether your staff is tech-savvy or not, they need to master on the utilities of POS. Interact with them on how you can save on wastage, applying effective restaurant inventory management, tracking all that is coming in and going out, and such likes. The success in your restaurant inventory management will witness your F&B progressing in revenues. Because once your staff is aware and assure you that they’ll take care of all this, you’ll see that a lot has been saved in spoilt food or wastage. To secure your restaurant inventory from any unwanted usage, you can limit your staff access to the information not pertaining to their role at your restaurant. Allocate separate credentials and access controls to each one of them. The POS system keeps track of their activity, so that you keep a vigil on inventory, eliminate thefts and wastage. Ask your staff to line-up the restaurant inventory according to their expiry dates or their In-time at your kitchen; and dispense the inventory as per the FIFO rule. Even the ready-to-serve food dishes that have been cooked for the day has to be taken care of. The food item isn’t overcooked or undercooked. The item is tasty, and remains fresh till it’s served. Track your weekly or monthly orders and set the storage limit accordingly. Basically, taking care that what you serve is of the highest quality will compel your guest to return. Keeping a restraint on your storage in a point-of-sale system is essential (especially for perishable items) in food inventory management. Define the maximum and minimum storage levels at your restaurant to keep the inventory fresh and in an edible state. All the while, this also takes care that you never run out of stock while you focus on other aspects of restaurant management. Storage also implies to keep your store, kitchen, serving floor and warehouse clean and tidy. Schedule regular fumigation once a week before stocking up. Additionally, you can ask your store manager to maintain the temperature as per the necessity of food stock such as vegetable, fruit, meat, ingredients, and spices. This way you eliminate wastage, which poses as one of the best practices in inventory and stock management. Now, it’s definitely not easy to do a complete restaurant inventory check night and day. It’s time-consuming, frustrating and susceptible to errors. Even while you’re serving the dine-in orders or taking care of delivery orders, a miscalculation may happen. To avoid such instances, you can execute a cycle count as a routine. The cycle count will ensure a daily scrutiny of the inventory in the division while taking care of not disrupting the ongoing movement or usage of items. Because of this cycle count, your staff doesn’t need to stay extra hours at daily closing. Once you’ve done it, you can tally with the existing stock on hand and items consumed, which will then give you a clear idea of your restaurant’s inventory consumption. Definitely, your F&B outlet is known for the lip-smacking delicacies you serve. In this case, maintaining the original taste of your menu is the biggest challenge for you. Here, you need to focus on your recipe management as well, by configuring the recipe in your restaurant POS system. For this reason, you’ll be able to competently segment your dishes. Besides, it helps your chef in keeping your menu taste intact, concurrently keeping a check on the inventory and stock used to prepare the items ordered at your outlet. Often, you may have come across a few unfamiliar entries in your restaurant inventory consumption report. On that account, you can set up a process which gets you a request when your staff wants to consume the stock; and you can approve it accordingly. Thus, a software which keeps track of all inventory requests will keep you in the forefront. For instance, when your chef wants to use a list of items, you receive a request. Once you approve it, only then will he be able to use it. Basically, nothing is missed from your eye, and any kind of inventory or stock misuse is eliminated. Similarly, the purchase orders won’t be sent ahead to your vendors unless you or your store manager authorize them. Though you do need to take care that all the items have been received in an appropriate condition. If you find anything wrong with the order, make sure to report it to your vendor immediately. Apart from purchasing the inventory and stock, you’ll find many overhead costs involved in restaurant inventory management. Since your purchase amount gets flexible with time, you need to update your item rates at your restaurant accordingly. The menu item rates should be set in a way that all your production, management and overhead costs are covered with a regular sell. If you are a chain of F&B, then you should consider transferring your unused inventory to some other outlet where it’s used well. The restaurant software you choose should give you an option to shift the food items to another outlet. Now you may witness a high guest influx regularly at your restaurant if you’re a well-known name in your locality. For this, you ought to store an emergency stock of frequently ordered items at your outlet. This can be termed as a backup inventory, to save you from the reactions of disappointed guests. Again, do keep a limit on your backup inventory too. Otherwise, it may happen that your backup inventory also gets wasted big time. Time and again, you may be setting up seasonal menus at your eatery. Therewith, some items may be available at a particular time, while you may serve some all the year round. To handle such scenarios, you need to keep an eye on your changing menu items and be agile enough to pile up your inventory and stock accordingly. 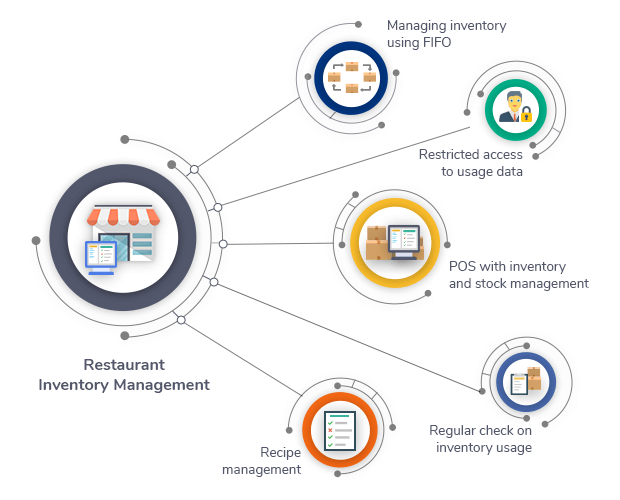 These are just a few of the best practices for your restaurant inventory management which are coming to my mind. And if you notice, all of them can be executed fittingly using an ideal restaurant POS software, which gives you a complete control over restaurant inventory. eZee BurrP!, a comprehensive POS takes care of not just your inventory, but handles everything right from food ordering to billing, ultimately simplifying your restaurant business management.